Have you ever wondered why all roads lead to Rome? 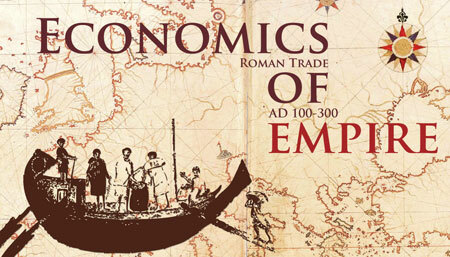 Find out in the newest installment of our Rotating Gallery: Economics of Empire: Roman Trade AD 100 - 300 opening to the public on Saturday, March 16. This exhibit explores the trade routes of the Roman Empire (circa 100-300 AD) and the merchandise that traveled across Asia, the Middle East and Europe. Silk from China, spices from India, grain from Africa and silver from Spain all traversed the Roman Empire. Learn about ancient shipping routes with an exciting interactive map and discover the scents of Rome with a “scent-ual” station. Exhibits in the Rotating Gallery are curated by students of local universities for internship projects under the direction of MOWT Curator of Exhibits and Research, Tim Howard. Economics of Empire will be curated by WSU student and long time intern and volunteer at the Museum, Kristy Lowrey. As with all new exhibits, the Museum will also be holding a private opening by invitation only for Members and special guests to get a first peek. Join us from 6-8 p.m. on Thursday, March 14 as we unveil the newest installment of the Rotating Gallery. Enjoy tasty hors d'oeuvres and wine from local businesses, engage in fun and educational activities for all ages, and see what Romans were trading at the height of their civilization. Please note: This opening on March 14 is an exclusive event for up-to-date Museum Members. Not a member? Join now and receive 10 percent off with mention of this article! These exclusive events happen several times a year. If you would like access to this very special event, please renew your membership or join today. To check on your membership status or join, contact our Operations Manager at 316.263.1311.